History: (X-Men Millennial Visions 2001 - "X-Men Evolution" (fb) - BTS) - As the only mutants at Bayville High School, Jean, Kurt, Pietro, Scott, and Rogue formed a band using their shared love of music, drawing inspiration from their life experiences as mutants. They wrote songs based on these experiences and began playing in underground clubs and bars. (X-Men Millennial Visions 2001 - "X-Men Evolution") - The public soon took notice of the band and their crowds became ever-increasing, and their popularity soared with the release of the mutant-pride anthem, "The Mutant Revolution Will Not Be Televised." Comments: Created by Ken Siu-Chong and Udon Studios. 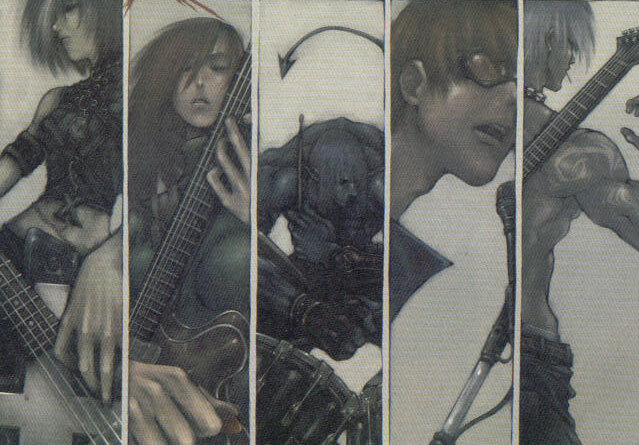 Jean was the lead guitarist for X-Men Revolution. She presumably had telepathic and telekinetic abilities, like her Earth-616 counterpart. --X-Men Millennial Visions 2001 - "X-Men Evolution"
Kurt was the drummer for X-Men Revolution. Kurt had a freakish blue appearance and presumably had teleportational abilities like his Earth-616 counterpart. Pietro was a guitarist for X-Men Revolution. He presumably had the same superhuman speed powers as his Earth-616 counterpart. Rogue was bassist for X-Men Revolution. She presumably had the ability to absorb the powers and memories of others, like her Earth-616 counterpart. Scott was the lead vocalist for X-Men Revolution. He presumably had optic energy beams like his Earth-616 counterpart.